Yesterday, I spotted several whales off of the Fort Bragg Coast heading north. We had spectacular viewings of the whales in January heading south and are anticipating a good showing of them over the next month on their northern migration. 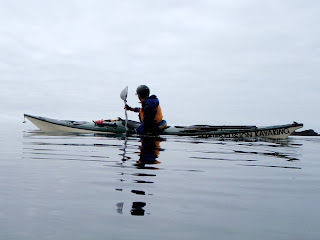 During the southern migration, we cruised in our kayaks along the whales' paths and were thrilled with our encounters. Seeing the barnacles on the whales backs as they pass by and hearing the whoosh of air exploding out of their blowhole is such a treat and an experience that is magical from a kayak. Residents and visitors to Fort Bragg and the Mendocino Coast celebrate the whale migration each spring with whale festivals. Details about the festivals are available at fortbragg.com or mendowhale.com. The charter boats are popular ways to see whales, but for a more eco-friendly and up-close and personal experience we enjoy kayaking to SEA the WHALES.